HEADQUARTERS, June 8th, P. M.–The enemy has been unusually quiet to-day along the whole extent of his lines, and nothing of importance has occurred. Two divisions of his cavalry, under Sheridan, reported to have crossed the Pamunkey yesterday at Newcastle ferry. Further from General Lee’s Army. 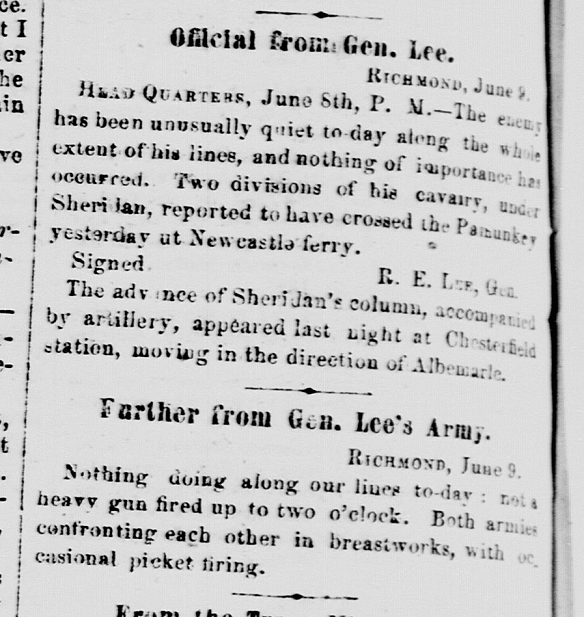 Previous post: NP: June 10, 1864 Raleigh Confederate: General Lee’s Army, June 7, 6:30 P.M.